I love the blog The Frugal Girl. It’s a regular inspiration to me. I subscribe to this blog and it’s listed in my blogroll because I love what she does over there. She has a great regular Friday series called Food Waste Fridays. The point is to see where you’re throwing money away by letting something go bad in your refrigerator. You might be surprised to realize how much food you are tossing out on a regular basis. I know I was! And I’m pretty frugal to begin with. Food waste costs money. If you aren’t careful it can cost a lot of money over time. It has brought me to a new level of awareness on how to prevent losses by making sure I use food before it goes bad. The Frugal Girl has a call-out on her blog for other’s to jump on board with Food Waste awareness and I think it’s a truly worthy one so I’m giving it a shot today. So how did I do this week? I managed to save half a carton of grape tomatoes that were starting to get just a tad wrinkly by tossing them in some olive oil and oven drying them. This is actually a great discovery for me. They turned out to be a fantastic snack to have on hand. My kids loved them and they are a great addition to a salad. If you haven’t tried oven dried grape tomatoes, they are really great. I saved some blueberries and strawberries that had started to look ugly but were actually still smoothie worthy by popping them in a freezer bag for future smoothie creations. I’ve also noticed I’m very close to the use by date on what’s left of a dozen eggs so we’ll be doing some baking today to use them up. The last fifth or so of a bottle of Pace Picante Salsa. It had gotten pushed to the back of the fridge because I’ve been making my own salsa lately. It had grown some green fuzzies inside. Pretty gross. A small piece of chicken leftovers that didn’t make it into a sandwich of salad lunch. The last couple of sips of a 7-Up we’d forgotten about since we almost never drink soda. 2 containers of baby yogurt way past their use by date. Half a lemon that didn’t get used and is just not salvageable. At first glance this morning I thought I’d done pretty well. I thought it was only the small piece of chicken and the last fifth of the battle of salsa. But when I looked closer at my refrigerator contents I was pretty disappointed in myself. What a waste! It may be only a few cents here and there but it adds up. Clearly I need to work at this. Our biggest challenge seems to be things that get pushed to the back of the fridge. We seem generally to do well on using up our produce but not so well on the odd occasional items that we aren’t in the habit of using regularly (like soda or lemons). We need to do better! Thank you to The Frugal Girl for helping me to be more aware of tossing money in my trash can! I think I’ll be jumping on board her call out every Friday to help keep me in check on reducing and hopefully reducing food waste in our household. It is not budget friendly to throw away food. We’re taking a use it or lose it philosophy with the food in our refrigerator from now on! So how about you? How aware of your food waste are you? Do you find yourself throwing away food you just didn’t use? My first Food Waste Friday and not doing so well here. Let's hope next week is better. Posted in Practical Things and tagged budget, budget friendly, food, food waste, frugal, goal. Bookmark the permalink. Hey, not bad for the first week. It gets better. And then, sometimes, it gets worse. Thank you! I’m glad to know mostly it gets better. Strangely I found I did better when we lived in a house with a 16.5 cubic foot fridge (let me tell you about small!). Now I have a 25 cf fridge and things seem to get lost in there so much easier! First…great post. I was cleaning my fridge the other day when I too thought about how much I waste, especially on baby food & non-essential items that we don’t use on a regular basis too. Since I’ve been meal planning, I only by produce I need for recipes, so I’m good there. I’ll have to give this concept a try in 2 weeks (when we’re back from camping). One thing off topic…I see you buy “YoBaby Yogurt.” I use to too because Austin LOVES yogurt. But I realized how expensive it is, especially for the amount of yogurt that Austin eats a day (he can go through 1.5 – 3 little tubs depending on how hungry he is). So I went on a hunt for an alternative that was available in larger quantity, and still made with whole milk & was organic. It took me awhile but I finally found some. It’s called “Brown Cow; Cream on Top.” Right now I’ve only been able to find 3 flavors that they make in the larger tubs: chocolate, vanilla & maple syrup. So before I bought the big tubs & potentially wasted money if Austin didn’t like it, I bought the smaller “individual” sizes to find out which flavors Austin liked best. Austin loves the vanilla & maple syrup, so now I buy the large tubs to save money. Check it out & give it a try. Let me know what you think. I agree that the YoBaby is expensive. We don’t buy it often because of the cost. That Brown Cow sounds great! I haven’t seen it here unfortunately. We have such limited options where we are. Sigh. But I’ve been inspired to start making my own. It’s pretty darn yummy. If I run across that the Brown Cow I’ll check it out. Sounds great. Do you shop at Costco? They sell a whole milk vanilla yogurt too. I think it is called something Mountain Yogurt. I just discovered it on Monday when I was in the checkout stand. The gal behind me had some & put it on the conveyer belt when I saw the words, “Made with whole milk.” Its like a pound of yogurt for like $6. Now that is a good deal! One thing that my mother has instilled in me since childhood is the value of scraping. 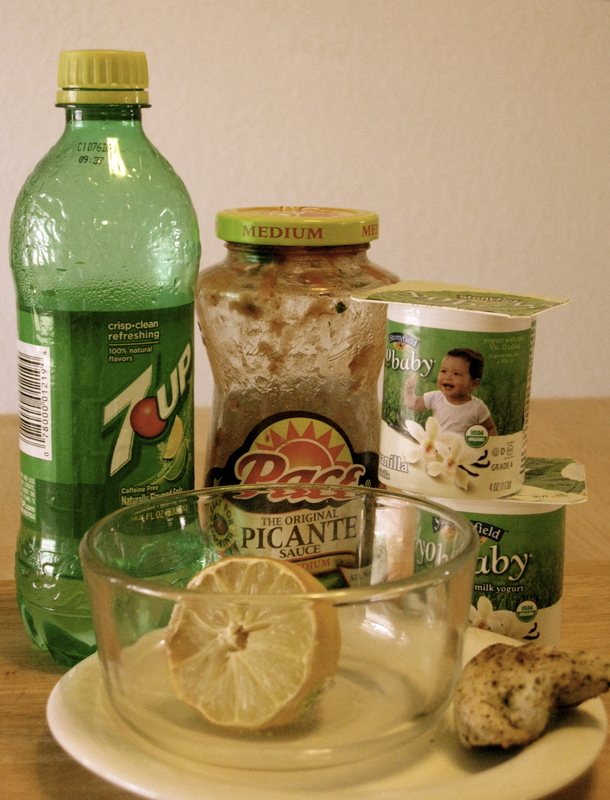 A lot of yoghurts, salsas and other canned products can be salvaged by simply scraping off the top layer of mold. It sounds gross but the stuff underneath is usually completely edible. And many products are said to “expire” WAY before they actually do. For instance, eggs can be eaten up to a month past when the store says they’re no longer good. And my final tip is the incredible worth of the frittata/omelette/quiche. When I notice a lot of my produce is on the downhill it all gets tossed in which some whisked eggs and milk and you don’t even notice the vegetables are a little passed their prime. Hope that helps! Good luck with everything! Excellent points and tips! I know it will help me in keeping my food waste minimized! Thank you! AMEN to the frittata…a new staple in our household too! Saves the scraps & tastes YUMMY! Thank you! Glad to be on board. I’ve had the benefit of reading your Food Waste Friday for a while so I’m sure it’s helped a ton! As far as first weeks, go this is fantastic! My first several months were terrible, mostly because I kept forgetting I was supposed to be paying attention to what was in the fridge. Good for you for already having some successes and knowing that you have a problem with things that get pushed to the back. I’ve been doing this for well over a year and STILL have that problem. Mistie-I did not! I’ll be checking it out! Thanks! You are very welcome. I find it really helpful. It’s nice to have a resource for such things. I can never remember how long things are good. Sell by dates are helpful…in the store. lol. But most things are definitely still good after that sell by date. I also find their storage tips helpful as well as their Q&A section. There are a lot of things that I used to throw out because I wasn’t sure it was still okay and I figured “better safe than sorry”. Wasted a lot of food that way.